How Do Minerals Effect Our Health? by Nicole Gulotta for Thrive Market If the only things you remember about your high school chemistry class are white smoke experiments and the periodic table, you’re probably not alone. But it turns out that many of those chemical elements play an essential role in our health! That comes as no surprise to Trace Minerals, which has been making nutritional supplements for 40 years. The company harvests its minerals in Utah from one of the last remaining North American inland seas. We recently chatted with training director Dr. Darrin Starkey to better understand how minerals support our bodies and to learn more about what makes Utah’s water so special. Read on! How do minerals affect our health? In a perfect world, we’d all meet our daily nutritional needs from the food we eat. Unfortunately, poor soil quality means we may have nutritional deficiencies even if we eat a healthy, well-balanced diet. Properly balanced mineral levels help our bodies in several ways, from building and regulating our cells to supporting our heartbeat and brain activity. What makes Utah’s inland sea such an ideal place for harvesting minerals? Our ponds are surrounded by mountains, so when runoff from melting snow rushes down to the rivers and streams below, it picks up minerals from rocks and soil along the way. Since there are no outlets, the sea becomes a catch basin for all these ionic trace minerals and elements. What’s amazing about this process is it’s done solely by Mother Nature! We don’t use any dyes, chemicals, or man-made processes to concentrate the mineral water, just the heat of Utah’s desert sun. Can you tell us more about the mineral harvesting process? The water is extracted in early summer and deposited into private, solar evaporation ponds on the northwest side of the inland sea. Thanks to the unique design of our ponds, harvesting takes only four months and uses less lake water to yield the same amount of minerals. What’s amazing about this process is it’s done solely by Mother Nature! We don’t use any dyes, chemicals, or man-made processes to concentrate the mineral water, just the heat of Utah’s desert sun. ConcenTrace®—our unique blend of ionic, electrolyte minerals, and trace minerals—forms when several environmental factors align, like temperature, time of day, and the size and shape of the crystallized minerals. During harvesting, we test the water several times a week for purity, and once the ponds are filled, the concentrated mineral water is triple-filtered and placed in food-grade tanks. Once transported to our facility, the water is evaluated for purity one final time before heading to a third-party for verification. What are some of the ways people can incorporate minerals into their daily routines? The ideal way to incorporate minerals is through diet. Simply putting a few drops into every glass of water you drink throughout the day is a great way to make sure you’re taking the minerals consistently. For those new to minerals, what’s the best product to start with? 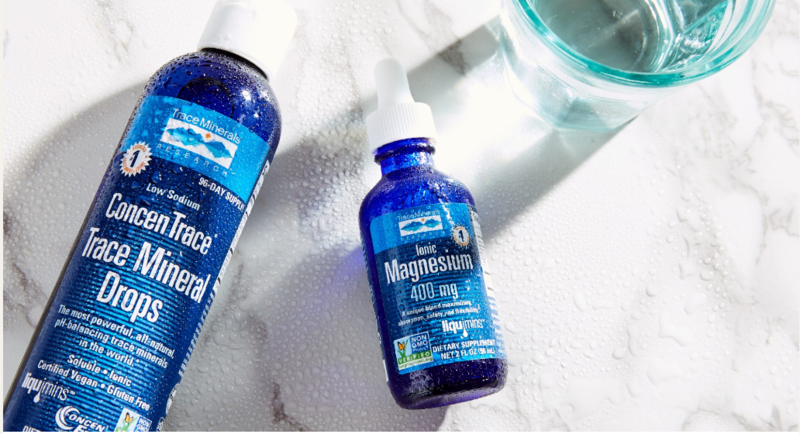 Our ConcenTrace® Trace Mineral Drops contain over 72 naturally-occurring ionic trace minerals. It’s easy to use, and complements other supplements you might be taking by helping your body better activate and absorb those nutrients. Whether you’re a first-time user, or a seasoned supplement taker, this product can be added to any kind of liquid—water, juice, smoothies, protein shakes, soup, or tea—and can be taken throughout the day to “feed” the body.